This Series started very simply for me – a cardboard sign with Philippians 4:19 written upon it, with ALL YOUR NEED larger than the rest of it. 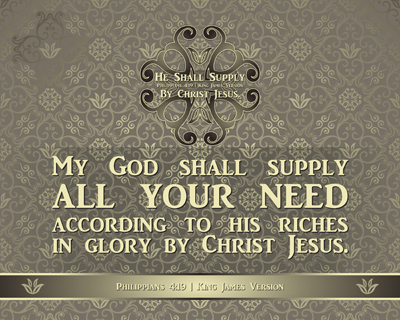 No matter what my need is or what your need is, God shall supply that need to whatever extent we need Him. Did you get that last part? There is not a “want” in there, but rather our “need” that our Heavenly Father is promising to meet. It is “almost” too simple to comprehend, but it is exactly what He means by it. Only four short verses are used in sharing this much needed simple understanding of three words, helping us uncover a truth that we as Christians can share with anyone. The words discovered are the following: supply (to fill), furnished (to put/set on) and provision (to provide ahead of time) – all having to do with supplying. That can be a hard statement to realize or see at times – for we have to understand the “supply” that is being promised. We’ve become a society of want-ers to a large extent because we have such access to just about anything one could have a desire of or think we may need to have. Should we take a few moments to ask with our need focused on how we could/would use it as if Christ were personally handing it to us, I do believe we would change what we ask for… Now I am not in too expectant of a manner saying that we should or need to compare what we are asking for today to what may have been available to Christ in His earthly ministry… but it might help our perspective if we gave that a try now and again to create perspective. The pivotal word is “need” and the end provider is “by Christ Jesus” as made possible “according to His Riches in Glory” – now we can see the ownership of those items supplied, they come from Him. This is yet the first step, an overlooked one I’m afraid of even Christians, the declaration has been made as to Who is being called on to provide the Supply – My God – which requires a walk of Faith, a sweet Commune and Relationship with our God and Saviour. This simple Series is based on four (4) Scripture passages, providing an easily understood progression to sharing our walk with God and is a reminder of His Grace in making it possible to follow Him in the messed world in which we live. Each of us have somewhere along life’s trail heard someone say that doing this or that is “hard”, indicating quite unintentionally that they “might as well not even try…” to do whatever they are speaking about. Added to that, comes some form of “I’ve tried so many times to…” – giving some indication that a re-grounding or re-alignment process has been attempted. How, then, can we Encourage others who find themselves in that situation? Actually, that is the easy part! Brag on our Great Big God! Follow that up with your Salvation testimony – short version. Add how God’s Word is the Guide of all Guides, sharing verses that have specifically changed/challenged and inspired you. Round out by telling them how the Word, Prayer and the Holy Spirit make it possible to walk this journey in life “honestly” and provides a way of escape for you from sin and the consequences it brings. Four very practical passages of Scripture that give us a manner in which to witness of God’s Amazing Grace are provided in this Series, allowing us show through our lives the Word of God at work.